Andrew Huot: "I enjoy observing the world's small, passed-over details; looking at everyday situations, I distill them down to their essence and then extend it outward to our collective experience. In my current work, I observe my environment and pay attention to things I might miss while I am busily going about my day. I reflect on my own experiences and life, from daily dog walks and trips to visit relatives, to interactions with my wife. 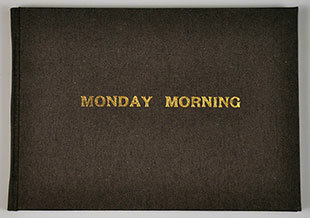 I want to make the viewer laugh and pause to consider the unnoticed facets of the world." Normal, Illinois: Tank Dive Press, 2016. Edition of 25. 4.25 x 6.25"; 18 leaves. Laser printed. Bound in cloth over boards with stamped title on front cover. Signed and numbered by the artist. Andrew Huot: "Monday Morning came about while walking the dog in my neighborhood in Normal, Illinois, where I discovered the unfamiliar in my familiar landscape. Monday was garbage day and the city provided trash containers for each resident. Although the cans are all the same, they appear different when staged in front of the various houses in the neighborhood. Each can takes on its own quality, standing alone, piled to overflowing, parked on the street, or resting in the grass; monuments to our refuse standing tall on Monday morning." Philadelphia: Tank Dive Press, 2008. Edition of 100. 7.25 x 3.25 x .25" closed, 7.25 x 26 x 8" open; 12 unnumbered pages. Accordion structure with drop downs. 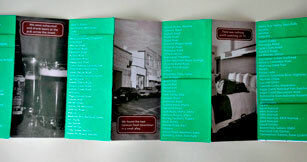 Printed with offset lithography at the Borowsky Center for the Publication Arts at the University of the Arts. Andrew Huot: "This book chronicles a journey by car from Philadelphia to Portland with memories from the road and the stops along the way. 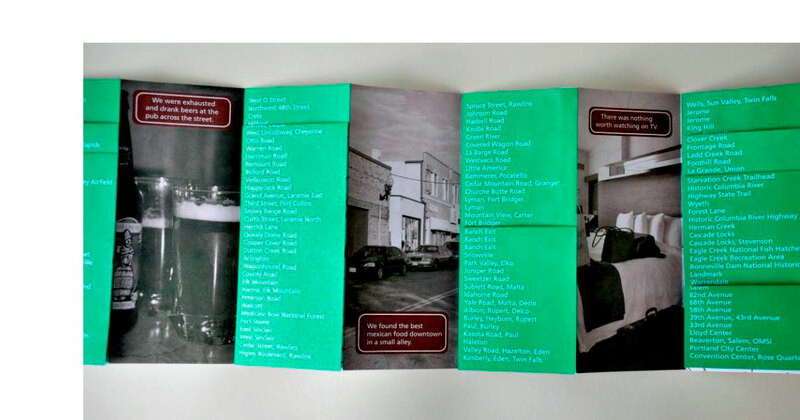 Made as an accordion structure, the book has drop down lists of the exit signs along the way." 5 x 7"; 8 double sided unnumbered pages. Accordion structure. Printed offset on Cougar 98 Bright paper. Printed at the Borowsky Center for Publication Arts at The University of the Arts. Photographs printed as duotones with grey and black ink. Green foliage printed from hand cut stencils. Andrew Huot: "Color can be a journey. 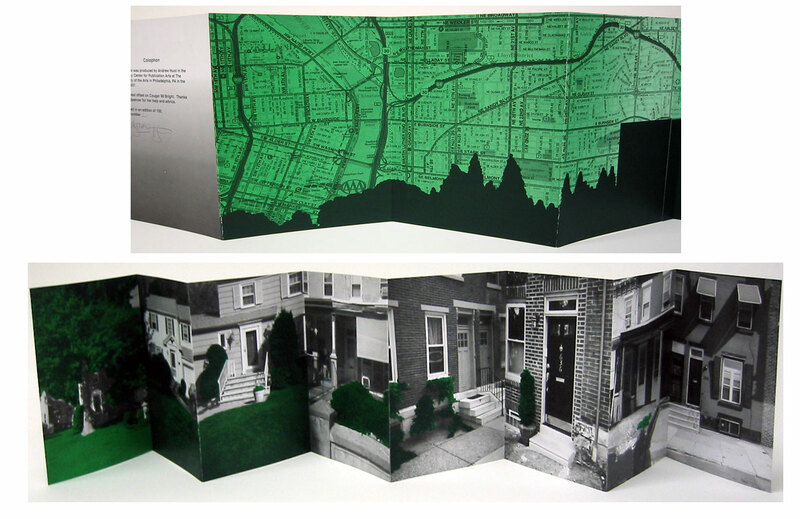 This book follows the journey from west to east, from suburban to urban, and from green to grey." Normal, Illinois: Tank Dive Press, 2008. Edition of 50. 2.5 x 3.5"; 35 unnumbered leaves (33 printed cards, 2 blank cards). Printed letterpress with hand set type and photopolymer plates on Crane Lettra paper. Instruction sheet included. Contained in lightweight cardstock folded with slip in closure. Andrew Huot: "Are you too busy to talk to your loved one, never see them at home? 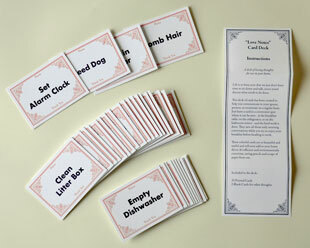 This set of cards is perfect for the busy family on the go, with notes and reminders for the ones you love. Save all that paper and ink with these reusable cards." 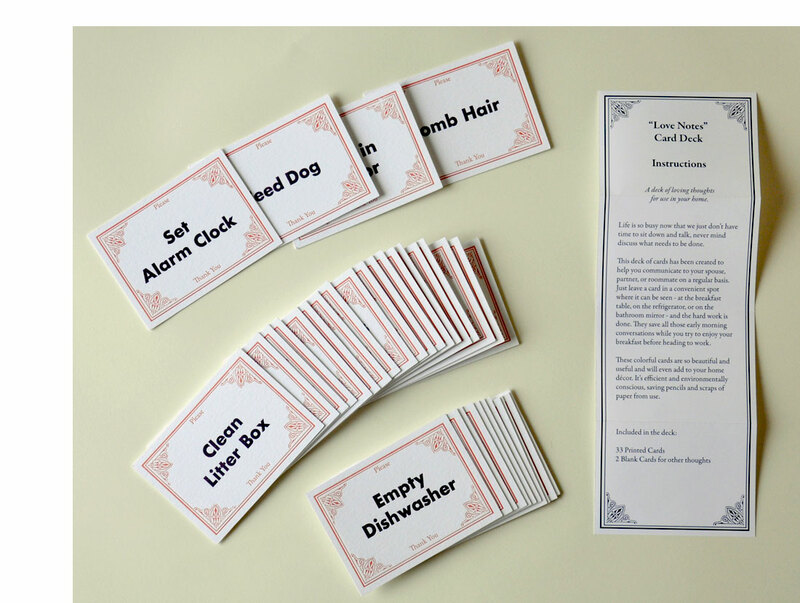 Instructions: "This deck of cards has been created to help you communicate to your spouse, partner, or roommate on a regular basis. Just leave a card in a convenient spot where it can be seen - at the breakfast table, on the refrigerator, or on the bathroom mirror - and the hard work is done. They save all those early morning conversations while you try to enjoy your breakfast before heading to work. ..."